Graduate students take notes in a seminar run by Professor Martin Pickavé. The 2018-19 Graduate Course listings have been posted below. Please note that these listings are tentative; some courses are still awaiting more detailed descriptions. 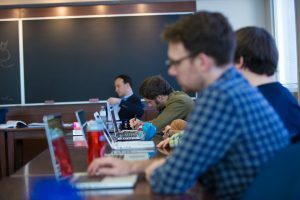 ⚠ Students who are not graduate students in the Department of Philosophy must secure an instructor’s approval before taking a graduate-level philosophy course. You will not be able to add these courses to your schedule via ACORN. Fill out the SGS Add/Drop Course(s) Form, have it signed by the instructor, and submit it to the Graduate Administrator. Students from other Ontario universities must request enrolment in U of T graduate-level courses through the Ontario Visiting Graduate Students Exchange Program. Contact the Graduate Office of your home university for more information. Description: This course is mandatory for CPAMP students in year 1 and 2; program students who have fulfilled this requirement are expected to attend regularly. Other interested doctoral students are welcome to attend as well and should contact the program director to indicate their interest. The proseminar has three components: a series of seminars; an ancient Greek philosophy reading group and a Latin medieval philosophy reading group. All students in the proseminar must attend the seminars and at least one of the reading groups; students are warmly encouraged to attend both reading groups. For the course schedule and details on the reading groups see the CPAMP website. Description: This course will be devoted to a close reading of the Arcades Project, Walter Benjamin’s unfinished and posthumous montage of fragments, quotations and aphorisms on the urban culture of Second Empire Paris – “capital of the nineteenth century.” The birthplace of consumer capitalism and the site of numerous failed revolutions, nineteenth century Paris crystallized, for Benjamin (writing during the rise of European fascism), the numerous ambiguities of modernity itself. Many of these ambiguities were registered in disorienting new experiences of space and time. While exploring Benjamin’s reading of the various strands of nineteenth century visual culture – streets, photography, advertising, lighting, furniture, fashion, railways, exhibitions, department stores, catacombs, museums, etc. – we will consider the implications of his approach for thinking philosophically about history, memory, and politics today. Our reading of the Arcades will be supplemented with readings from Marx, Adorno, Brecht, Aragon, Simmel, Freud, Baudelaire, Blanqui, and Fourier as well as contemporary critical theorists. No specific background is required, but it would be helpful to read Marx’s Eighteenth Brumaire beforehand. Description: Traditionally, epistemology has dealt with the ways in which an individual acquires knowledge through perception and reasoning. However, in recent years it has become apparent that the traditional discussions of knowledge in general, and scientific knowledge in particular, fail to capture important aspects of the social dimension of knowledge. We acquire most of our beliefs from the testimony of others, including experts, and from social institutions, such as scientific communities, that are in charge of the generation of knowledge. The relatively recent branch of philosophy that deals with the social dimensions of knowledge is called social epistemology. It has developed out of traditional epistemology through dialogue with the sociology of scientific knowledge. The course will provide an introduction to social epistemology in general and social epistemology of science in particular, and it will deal with various aspects of the nature of knowledge from this new perspective, including issues such as the development of scientific knowledge, the influence of social and cultural factors on scientific knowledge, scientific realism vs. social constructivism, distributive cognition, holism vs. methodological individualism, trust, expertise and consensus, social-digital epistemology, and Feminist Epistemology and Epistemic Injustice. The course will be conducted as a seminar. Description: This course examines central theoretical issues in contemporary thought with particular attention to the role that the “Frankfurt School” and its affiliates such as Benjamin, Kracauer, Horkheimer, Adorno, Marcuse, Habermas and others play in the context of modern German social and cultural thought. In France, thinkers like Levinas, Foucault, and Derrida respond to this tradition and enrich it. The course explores in which way the continuing dialogue between these thinkers informs current critical approaches to rethinking issues and concerns such as theorizing modernity, culture, secularization, multiculturalism, and the vital role of cultural difference. Description: This course will be a graduate-level survey of medieval philosophy designed to acquaint newcomers with the field. To that end, we’ll look at several issues that cover several different periods of medieval philosophy, with some attention given to the institutional and social role played by philosophy at different times. Some of the issues may include: epistemology (scepticism and the limits of what can be known); philosophy of mind (faculty psychology, the nature of the mind, relation of the soul to the body); metaphysics (identity, individuation, the problem of universals); natural philosophy (the eternity of the world, causation, determinism, the existence of a first cause); ethics (virtue and vice, free will). The exact topics will be chosen depending on what students are interested in. Knowledge of Latin (or Greek / Arabic / Hebrew) is not necessary but of course will be helpful. Students can write either one long research paper at the end of the term or two/three shorter papers in the course of the term. Philosophy graduate students who wish to take a reading course must draw up a detailed course plan with a member of the philosophy graduate faculty who is prepared to provide supervision. All reading courses must be approved by the graduate director. Please fill out a Request for Reading and/or Research Course form. Description: The Proseminar is a writing-intensive introductory course for all and only first-year PhD students. Given the instructors’ specific expertise, much of the focus will be on ethics and, more generally, rules, though with connections to other parts of the discipline. In particular, some readings will touch on or concern the history of philosophy, metaphysics, conceptual analysis, epistemology, the philosophy of language, the philosophy of gender, or philosophical explanation, i.e. how far it should go. Student participation in the classes will be very much welcomed; alongside regular short writing assignments, there will be an essay requirement. Description: The course is devoted to Plato’s metaphysics, including especially his so-called theory of Forms, his postulation of a superordinate Idea of the Good, which is the unhypothetical first principle of all, and the immateriality of intellect or soul. We will focus on those dialogues where these topics are the central focus, including Phaedo, Republic, and Sophist. Selected passages from a number of other dialogues will be brought in along the way. Also, we will pay some attention to Aristotle’s testimony about Plato’s metaphysics. Description: The development of formal logic toward the end of the nineteenth century promoted a philosophical style and method, which has become known as Analytic Philosophy. In this seminar, we will examine some of the central texts of two of the principal authors of this tradition, Gottlob Frege and Bertrand Russell. Our approach in the seminar will be historical: we shall try to gain an appreciation of these figures as systematic thinkers. A course in formal logic (for example, an undergraduate course equivalent to PHL245H) is a prerequisite for this course. Description: A sustained focus on the meaning and implications of respect for autonomy in health care settings. Topics discussed include the right to die, decision-making involving pediatric and psychiatric patients, medical interventions in human reproduction, and connections between access to material resources and patient autonomy. Description: In this course, we will study issues in modal logic, with special attention paid to the topological semantics, which pre-dates Kripke semantics and is currently experiencing a revival. Description: Conditionals play a central role in thought and action. In addition to categorical beliefs about how the world is, we also have beliefs about how things would be, were things to have been otherwise, and how things are on the supposition that certain things obtain. Such conditional beliefs account for how our view of world changes, or at least ought to change, as we obtain information, and how we act, or at least ought to act, in light of our desires. This course will explore various topics concerning conditionals. In particular, we will look at the semantics of conditional sentences in language, the role of conditional beliefs in updating, and the role of conditional beliefs in decision making. Description: This course will study classical writings on sense and reference in contemporary philosophy of language, including articles by Frege, Russell, Strawson, Donnellan, and Kripke. writing sample and publication, teaching and generating classroom discussion, the politics of the classroom, and more. The Seminar is a required course for all MA students, and is graded on a CR/ NCR (Credit/Non-credit) basis. Description: This course is an introduction to the major figures and themes in classical Islamic philosophy (falsafah) from the 9th to the 12th centuries, with a focus on the works of Al-Farabi, Avicenna (Ibn Sina), and Averroes (Ibn Rushd), as well as other less well-known figures from the classical period. We will consider a range of philosophical problems in the areas of metaphysics, philosophy of mind, and epistemology, as well as topics in ethics and political philosophy. Some consideration will also be given to the views of the Muʿtazilite and Ashʿarite schools of theology (kalām), the rival intellectual traditions to philosophy within the medieval Islamic world. Description: Our aim in the seminar will be to read Plato’s Gorgias slowly and meticulously from beginning to end. Among the themes tackled by the dialogue are: the battle for supremacy between the nascent disciplines of philosophy and rhetoric; ‘the guise of the good’ (the dialogue is the first and most influential appearance of the idea), the fifth century BCE opposition between nature and convention (physis and gnomes); various forms of ‘amoralism’, championed by Socrates’ interlocutors; the nature of pleasure; the standards that must be satisfied by a genuine art or science and how they differ from inferior pursuits and practices (the dialogue contains the first statement of the opposition between reason and experience (empeiria and logos). Description: This seminar is intended to be both an in-depth study of the fundamental principles of Aristotle’s biology as well as a general introduction to his views about substance, essence, causation, and explanation. Among the possible questions to be addressed are the following: What does it mean for the soul to use the body or for the body to be “for the sake of” the soul? Why are growth, self-maintenance (nutrition) and reproduction all functions of the same vital capacity? How should we understand the soul as an efficient cause of generation? To what extent and in what ways do the details of the scientific explanations found in Aristotle’s biological treatises illuminate his metaphysics? Description: “Schelling is no longer a prominent name in the history of philosophy, at least not in the Anglo-Saxon world. There are few books devoted to him, no entry on him in the latest reference book on metaphysics. For all too long he has been treated as a predecessor to others, an ‘intermediate figure’ between Kant and Hegel.” So writes Frederick Beiser in 2002. The scholarship has improved a bit since, with distinguished scholars such as Eric Watkins, Michael Forster, Paul Guyer, and Sebastian Gardner having published important essays on Schelling. But in general Beiser’s words ring true today: there has yet to be a Schelling revival, as we have seen happen to Kant, Hegel, and even Fichte. The aim in this course is to give an introduction to Schelling’s philosophy, with the aim of engaging his work rigorously and analytically. No previous knowledge of German philosophy is required, although basic familiarity with Kant’s first Critique will be helpful. Description: In 1921, at the age of 18, Frank Ramsey translated Wittgenstein’s Tractatus Logico-Philosophicus. In 1923, before meeting its author, he published a Critical Notice of it, which still stands as one of the most important commentaries. He found problems with both things he identified as occupying Wittgenstein. First is ‘the non-mystical deductions’ that constitute most of the text—the arguing in detail for ‘the necessity of something in common between the picture and the world’. Ramsey threw spanners, such as the colour exclusion problem, into the works of that machinery. The second consists of indicating or gesturing at all the things that are ‘intrinsically impossible to discuss’. Ramsey worried that Wittgenstein’s distinction between saying and showing leaves out too much of importance (open generalisations, scientific laws, inductive conclusions, ethics) and that Wittgenstein’s form of representation itself was a piece of what Wittgenstein considered philosophical nonsense. In this course, we shall explore the argument that Ramsey’s persistent, pragmatist objections to the picture theory of meaning and truth set out in the Tractatus were largely responsible for Wittgenstein’s turn away from that approach and towards what we think of as the later Wittgenstein, with his emphasis on the primacy of practice and the idea that meaning is use. We shall examine their work, from Wittgenstein’s Tractatus and Ramsey’s Critical Notice, through the transitions in their thought during 1929 (when Wittgenstein returned to Cambridge), up until Ramsey’s death in 1930 at the age of 26. Description: This seminar will deal with the political philosophy of Plato, concentrating on his view of the good society. We will be reading and discussing Crito, Republic, Politicus, and Laws. Among the issues to be explored will be the famous charge of Karl Popper that Plato was, in fact, a proto-fascist. Description: Hobbes’s legal theory is one of the least studied parts of his political philosophy. This is because it is assumed that, as an early legal positivist, he set out a command theory of law according to which law is no more than the commands of a legally unlimited sovereign which those subject to the sovereign’s power must obey regardless of the content. His legal theory seems, then, highly authoritarian. As a legal subject, you should accept that you have consented to subordinate your sense of right and wrong to the ‘public conscience’ to be found in the law of your sovereign. But on closer inspection, Hobbes’s legal theory turns out to be a sophisticated account of the interaction of enacted or positive law with the ‘laws of nature’ that illuminates both our understanding of the modern, legal state and vexed issues in contemporary political and legal philosophy about the nature of authority. The main text for this seminar is Hobbes’s Leviathan. We will also read some contemporary work in political and legal philosophy in order to evaluate his contribution (HLA Hart, Joseph Raz, Bernard Williams). PHL2111S (Seminar in Epistemology) – Knowledge Never! Description: As a two-word summary of his titanic 2002 Knowledge and Its Limits (K&L), Timothy Williamson offers ‘knowledge first’. TW’s fundamentalism elevates knowledge to first-rank theoretical significance in the philosophy of mind and epistemology, because prior to belief in the order of analysis of mental and epistemological concepts/facts: in contrast to a ‘knowledge later’, reductionist opponent, who locates knowledge after belief in both orders. Positively, the fundamentalist gives knowledge (qua mentally basic relation between a subject and a fact) jobs like: ineliminable psychological-explanatory power, and the unification of diverse phenomena of epistemology (evidence, subjective probability, epistemic ‘norms’, skepticism). Negatively, the reductionist is scourged with: the collapse of the ‘Gettierological’ search for an analysis of knowledge; famous ‘non-luminosity’ and ‘anti-KK’ arguments, where ‘margin for error’ reasoning undermines ‘first-person privilege’. K&L will be scrutinized from a third, trust-expressivist perspective (on which knowledge appears never in the mental-analytic order): ‘Sam knows whether goats eat cans’ expresses a commitment to ‘trust’ Sam on whether goats eat cans (namely, to treat her opinion and the answer as indiscriminable). Various points to explore: a detailed account of various Gettierological quirks and other aspects of knowledge-discourse; the capacity of discourse to be both expressive and explanatory; parallels between ‘trust’ and ‘Moorean’ first-person privilege; licit and illicit perspective shifts in TW’s margin for error arguments; the invariance of evidence under shifts of perspective; asymmetries in TW’s treatments of synchronic and diachronic knowledge; the de-normativization of epistemology. Description: This course is concerned with non-human minds. There is now almost universal acceptance of the existence of animal minds despite a long history of significant philosophical and scientific skepticism. But the nature of these minds and how they relate to our own is still far from clear, as is the more general question of how far mentality reaches into the natural world. Mostly we will focus on animal minds, covering issues in animal cognition and consciousness, though some attention will be paid to recent work on plant mentality and bacterial cognition. Description: Laws of nature play an important role in both scientific and philosophical theorizing. In the sciences, laws of nature aim to capture, at some salient (e.g., physical) level of description, how systems of a given type evolve through time; through this role, such laws provide generalizations which are used to systematize regularities, predict and explain particular occurrences, and support counterfactual reasoning. In metaphysics and philosophy of science, laws of nature have been taken, by some at least, as crucial to understanding counterfactuals, nomological and even metaphysical possibility, and the nature of properties and other ontological categories. Associated with these rich traditions are many questions of interest, including questions about the metaphysical status of laws (What are the distinguishing features of laws? What are laws, from an ontological point of view? Are laws prior to regularities, or vice versa? ), about the mutual bearing of scientific and metaphysical theses about laws (Does quantum mechanics undermine Humeanism? What consequences does wave function realism have for our understanding of laws? Can there be diverse levels of natural reality, associated with special scientific as well as fundamental physical laws? ), and about the bearing of scientific or philosophical accounts of laws on other philosophical topics (Do physical laws eschew causes? Are laws contingent or rather necessary to the entities they govern?). In this seminar we will familiarize ourselves with certain paradigmatic cases of scientific laws and certain historical and contemporary accounts of laws of nature, with the aim of engaging such topics of interest in metaphysics and philosophy of science. Description: In this seminar, we will be considering a variety of questions in political and legal philosophy about equality, why it matters, and what discrimination is. We will start by looking at debates about how the value of equality should be understood within a theory of justice. What should its “currency” be: that is, is it equality of welfare, equality of resources, or equality of opportunity that matters? We will then consider debates between relational and luck egalitarians: should we aim at a redistribution of whatever matters, in such a way as to discount for the effects of bad brute luck, or should we aim for a society in which all relate to each other as equals? Are these different ideals, as relational egalitarians contend; or can everything we care about when we talk about “relating to others as equals” be captured by luck egalitarianism, as the luck egalitarians contend? In the second half of the term, we will turn to questions within discrimination theory, looking at recent philosophical work about the nature of discrimination and when and why it is wrong. Is discrimination wrong for reasons concerning the discriminator’s mental processes or biases? Is it wrong for reasons concerning the effects on the discriminatee or the group to which she belongs—perhaps the social message that it sends about this group, or the lower social status it assigns to the group, or the freedom it takes away from some members of the group? We will also try to think philosophically about the issues at stake in at some very recent cases of discrimination, such as Masterpiece Cake Shop v. Colorado Civil Rights Commission, Ewert v. Canada, and Dutee Chand’s challenge to the IAAF’s Hyperandrogenism Regulations. Description: The aim of this course is to prepare students entering the job market for careers as professional philosophers. Students will present and receive feedback on work from their dissertations, and receive training on preparing dossier materials, creating a website, and interviewing. Description: This course examines Spinoza’s metaphysics and philosophy of mind.